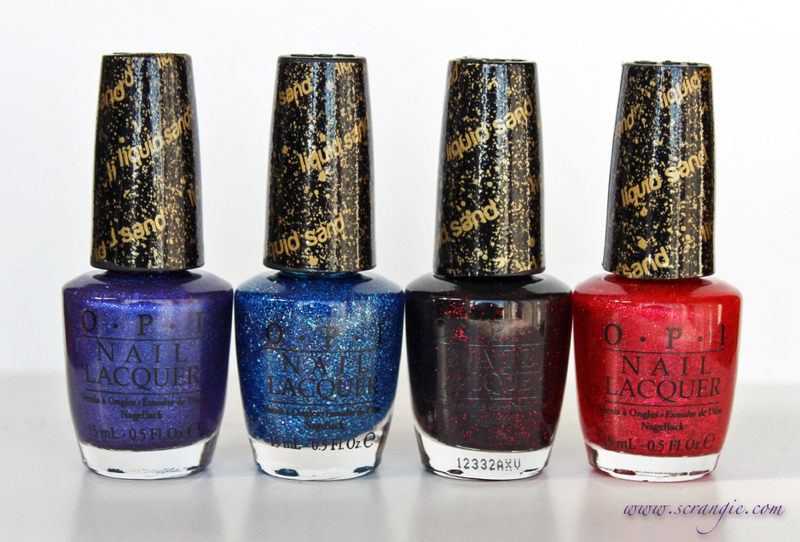 The Mariah Carey by OPI collection for Spring 2013 is a two-parter: Four 'studio' shades, and four 'stage' shades. The Stage shades are my favorite part of the collection for one predictable reason: glitter. Except these aren't just any glitter polishes, they're OPI's brand new Liquid Sand finish, which are glitter polishes meant to be worn without a topcoat to give "a never-before-seen look with a pebbled finish that lightly shimmers with fine glitter particles. Worn without top coat, Liquid Sand lacquer gives nails a unique textured matte finish." OPI Liquid Sand Polish in Can't Let Go. This is a heavily blue-toned purple base with purple and blue microglitter, medium sized silver hexagon glitter and bumpy, sandy grit. The base on this one seems just a touch too opaque to let all the glitter shine through, but I think that's the effect they were going for. OPI Liquid Sand Polish in Get Your Number. A sheer cool blue jelly base with opalescent microglitter and small, round hologram glitter. This one works pretty well both matte and glossy, but it is the sheerest of all the shades. 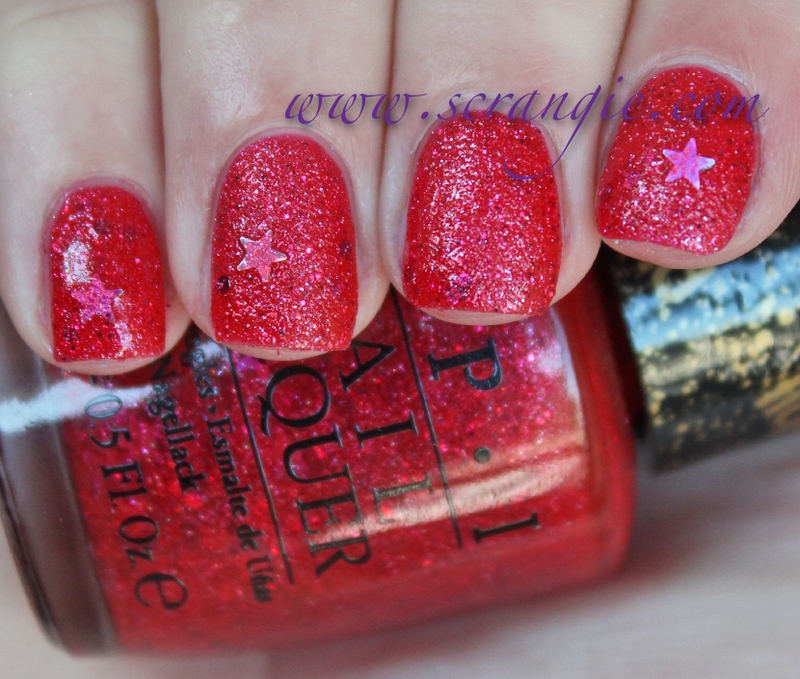 OPI Liquid Sand Polish in Stay The Night. A black creme base with small hot pink glitter and added sandy grit. I think this one would have more impact if it dried to a less-glossy finish. 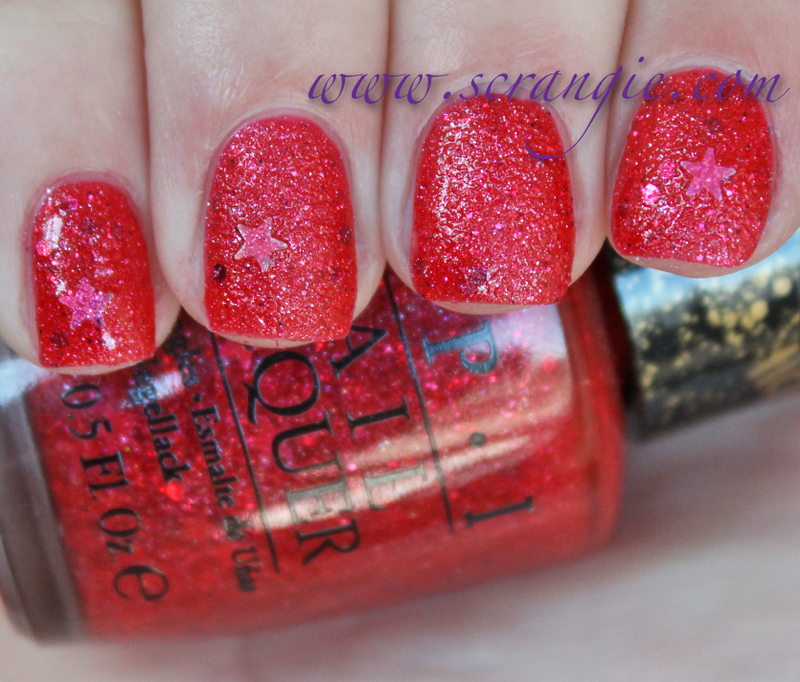 It looks good with topcoat, but without it, it just looks like your average lumpy glitter polish. 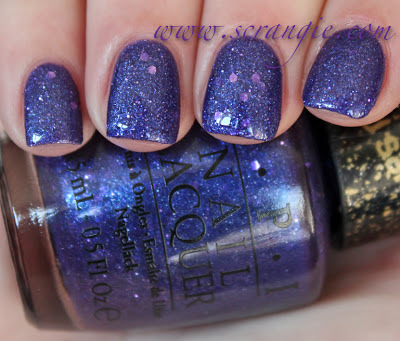 OPI Liquid Sand Polish in The Impossible. A bright pink-orange coral jelly base with silver, pink-red, and purple iridescent microglitter, medium silver hexagon glitter and large holographic star glitter. This one is my favorite. It has lots of depth from the combination of bright jelly base and multiple sizes and colors of glitter, plus it has the added kick of holographic stars to make it even prettier. I think the 'liquid sand' finish comes across the best on this one as well. It's matte enough to look sandy when it dries. The formula on all of these was great. They applied smoothly and provided even, streak-free coats with no added effort on my part. The only part of the formula I didn't like is that they're all somewhat sheer; I needed three coats for each polish to look its best. Dry time is fast. What I find strange about these polishes is that each one has some extra grit in it. It's not all glitter. There seems to be something in it that looks and feels like actual sand. Glitter polishes tend to look really gritty on their own without topcoat, but these take it one step farther. It's most evident in Stay The Night because it looks grittier/bumpier than it should be for the amount of visible glitter and the lumps are smaller than the glitter particles. Truthfully, I'm not really sold on the Liquid Sand finish just yet. I think they're too glossy to provide that sparkling matte sandy look that I love. Get Your Number dries the most matte out of all of them with The Impossible coming in at a close second. I could add my own matte topcoat to these to enhance the sandy look, but I actually prefer all four shades when worn with topcoat. I know, defeats the purpose... But, what can I say? I love shiny, sparkly glitters. 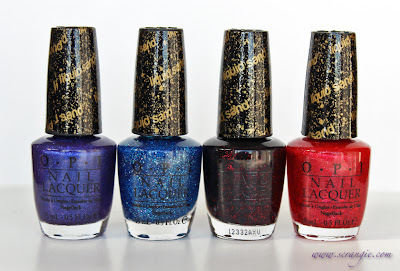 The OPI Mariah Carey Liquid Sand polishes are limited edition. I actually like these better with top coat as well. It just seems to make the glitter pop more, I feel. I'm excited to see what Zoya makes of their collection with a similar finish. How long did you let them dry? they still look wet in your pre top coat photos. When I wore Stay The Night it looked completely matte...yours still looks glossy. I'm also curious about how you got Stay The Night so glassy looking with only 1 coat of top coat, I needed 2 coats of Gelous and a coat of Seche Vite to make mine look like that!! Yes - I thought the same thing. Stay the Night dried totally matte for me too. And ended up looking a bit more grey than black. Definitely my favorite of the bunch. I also found they took longer than the average polish to completely dry. Yes! I was wearing it when I read this and mine was definitely matte and had turned more gray. By the end of the day, there were silver glitter flecks, too. I went home and added a third coat because I got a small chip on one of my wonky nails and I watched it. It did dry more glossy/satin, then within an hour or so was matte. This morning it's matte black with gray texture and the pink glitter. I love this color. Mine also turns out completely matte, but it did seem to take a little longer than normal to dry. It's got this really cool almost charred look to it, like burning embers... if fire was somehow hot pink. Hmm, I'll have to give it another try. I gave it a good 15 minutes to dry, it didn't seem like it was getting any less shiny so I snapped the picture. I wasn't crazy about the color so I didn't wear it as a full manicure. Will try it again this weekend! I heard someone say that the polish did feel dry after a short while but it took actually like two hours for the polish to look really matte. And some pictures i've seen of the polish did look more matte compared to yours. Great review! Is it hard to remove? About the same as any other glitter polish! I prefer them with a top coat too...haha. I would be bothered by the grit. Just not my cup of tea. They all look great on you though! I've seen several swatches of Stay The Night that look much more matte/sandy than yours. Is it possible you got a bad bottle? I still don't know how I feel about the Liquid Sand polishes. I think they're unique, but I am not sure if I like the gritty feel on my nails... Maybe I'll try the mini set first. I got the four minis, and I found I had to wait a long time in between coats, or else they dried semi-glossy instead of matte. I surprisingly really like these, they're just so sparkly! Stay the Night is my favorite - I like it both with and without topcoat. Yep not much of a succes for OPI if many people (including me) prefers them with top coat! Nail POLISH should be POLISHED not gritty?! )( but that's just me, and my preferences. By the way, do not miss my FIRST giveaway! I'm so excited about it! Maybe, but this is my second day with Stay the Night and I haven't added a top coat yet. I thought I'd probably do that on the second day, but I liked it matte too much to change it. It keeps changing and I like watching it go from black with pink glitter to black with gray flecks and pink glitter to black and gray with pink and silver glitter. It's sort of mesmerizing. I didn't get any of the other colors, but I'd buy more if they were black with different glitter. I want this in blue, purple, and green! Thanks for the review. I haven't tried any of these yet. I prefer them with topcoat too, but do they require more than one coat of topcoat? I imagine the grit and glitter would be very hungry! My mini of The Impossible had no star glitter at all either, which was OK because I didn't want any, but it's kind of false advertising. The opening of the mini bottle is so microscopic that I don't think the star glitter could fit through. I love these polishes! My Stay the Night turned out much more matte...guessing you got an off bottle! Great swatches! not a fan of the gritty glitter trend. it's just odd for me, i guess. they look much better with top coat, imo. Thanks for the beautiful swatches! I just bought the kit with 4 minis and applied Get Your Number tonight. OMG this feels so weird, I keep touching it and want to buff it. I'm not sure I can keep it on my nails without adding top coat and I think I'll prefer them with top coat too! I think I'll need to buy can't let go and stay the night. You write the best nail polish reviews, hands down! :) Love your blog so so much!! I totally agree, these look prettiest with topcoat. I was dreading that your swatches would make me want them, but no - they still look gritty. If I want my nails to look like sandpaper, I'll just stick some on. I don't think I could wear these without topcoat, but they are gorgeous with topcoat! I'm curious to know, how hard are they to get off? I didn't find that they were any more difficult to remove than any other glitter polish. Really gritty and a little stubborn, but nothing crazy! Are you going to review Skyfall? I've been dying to see your swatches of it! I thought you would love some of them. Yep! I only have it partially swatched, have been trying really hard to catch up! Very nice! 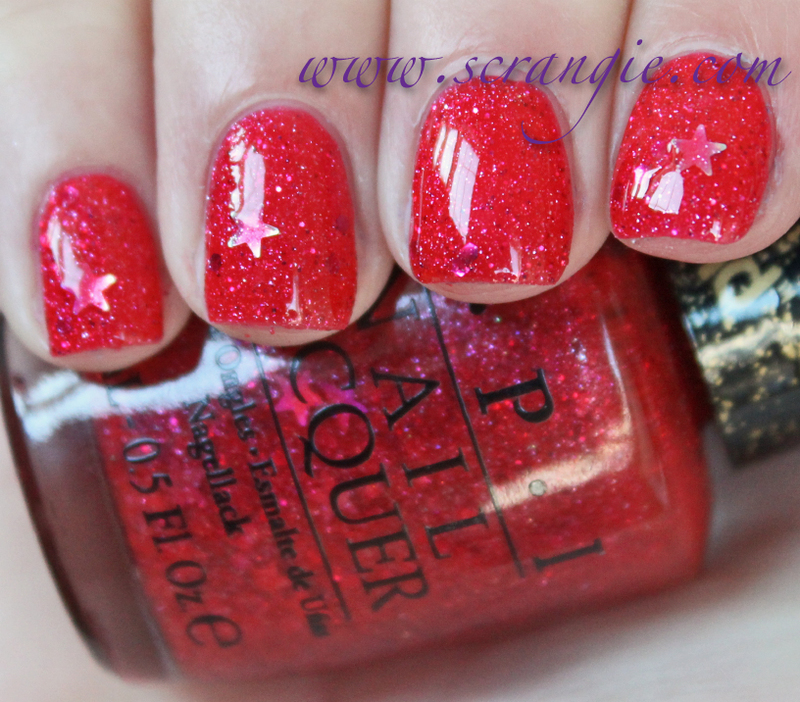 I like the glitter polishes so much! Stay the Night would be amazing if it weren't for the stupid liquid sand thing...even with two coats of SV mine still looks bumpy and gross! Picked the minis up on a whim the day after Christmas (good thing I did too: they were all gone by Friday. )This bumpier, glittery stuff stays on my nails longer and doesn't seem to wear away as quickly as many of my regular polishes do. I'm so thoroughly pleased that I'll have to go get the full-sized of these guys. My nails are painted stay the night without the topcoat and I love the matte finish. It's fabulous! I bought the mini set and I love the matte rough texture without topcoat! In all fairness I've only tried one (the Impossible which had zero stars in it) and I've been wearing it now for a few days. I'm going to try Stay the Night next. Great swatches as always! 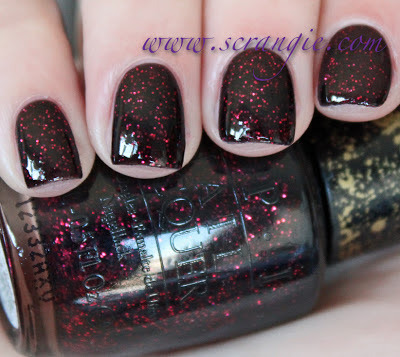 The only ones I could see myself wearing sans seche vite is The Impossible & maybe Get Your #. I do prefer Get your # glossy... So really I don't know why I'd even wear it matte. Maybe as an accent nail? I do really like The Impossible, though. I'd wear it both ways. Ill be checking this one out! Would have purchased the set of minis, but noticed that not one set had stars in The Impossible (the full size bottle was packed with them). Definitely would have been a bummer if I hadn't been paying attention. Went for Stay the Night instead. I did end up buying these, but the dry time is long for me. I think it just doesn't work as well with me as it did for you. I love them though! I don't like any of them! Very odd formula. I frankened an extremely lumpy polish ages back & it reminds me of this. Hate lumpy polish, not feeling the new Nails Inc concrete ones either. Its so weird. All the online swatches of stay the night make it seem so shiny, but irl it looks completely matte. 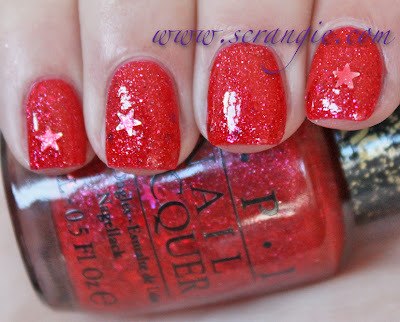 I am loving 'your number' and 'the impossibe' it's the first time I've come across a polish with stars in it! I think I prefer them all without the top coat, I wonder if the texture will start to annoy me though! Great post! I can't wait to get my paws on Get your number and Can't let go. Both are gorgeous with top coat. The other 2 I would probably have to see in person to decide if I wanted them. I remember when they released the first pics for this collection on Facebook so many people were just: "ewww". Lol and so was I and definitely I can't find these polishes any grace. Except maybe for get your number but the rest are a plain horror lol. Zoya have released a textured collection they look much nicer I think. I didn't care for OPI's Liquid Sand and I thought it was because I didn't care for the sandy, matte finish, but then I saw Zoya's PixieDust line and fell in love. I'm wearing Nyx now and it has become one of my favorites. Is PixieDust something you might review down the line? I also picked up Pink Yet Lavender from this Mariah Carey line and it's beautiful. I didn't really care for the rest of the Carey Collection. It just seemed a little odd, random, and overdone (not in a hackneyed way, more in a that-polish-has-way-too-much-going-on kind of way). ok, now i feel like i NEED stay the night, too bad i can't find it here. LOVE LOVE LOVE!! Someone may have already said this, but these take a long ime to fully dry to their real matte finish. If you leave them on for a few hours, and have another look, you'll get that stone-matte look.